INNOCEAN’s Celestina Lucero was our special guest at NARIP’s Advertising Music Supervisor Pitch Session this week where attendees pitched music for a luxury car brand campaign, among other things. At INNOCEAN, Lucero she is responsible for finding music that is on-brand for the clients, narrowing these selections down for the creatives at the agency. Staffing for the agency is several thousand worldwide, but Lucero’s team in LA is comprised of just three: herself, a copywriter and an art director. The process of music selection and presentation to the client is a highly specialized and fast-moving with a constant demand for music. Lucero told us that the music creative brief for one campaign has changed four times, and this is not uncommon. The brand is in search of a sound, and her job is to present the best options within the scope of the client’s request. NARIP members pitched for current placement opportunities and got direct feedback. A few of Lucero’s top tips: no attachments please, keep emails short. Music be able to work fast and adapt, a typical work flow would be to give brief to composers on Thursday, have them deliver music on Tuesday with revisions ready by Thursday. She prefers delivery options that enable her to click and play, and that display soundwaves (like Soundcloud). Thank you for making time for our session Celeste! Photos by Celeste Tauchar. 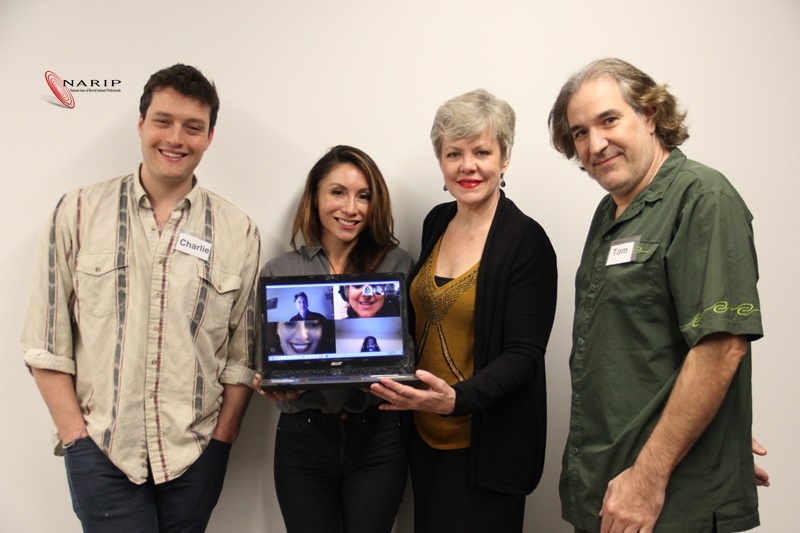 Photo (L-R): Charlie Lubeck, NARIP’s Tess Taylor, INNOCEAN’s Celestina Lucero, Tom Fritze. On laptop: Tamara Bubble, Joy Fluker, Renald Francoeur, Jade Goodge, Jeffrey Harrison, Jessica Holmick, Kat Pawlak, Jenny Shawhan, Gail Vareilles, Daniel Day Zuko.